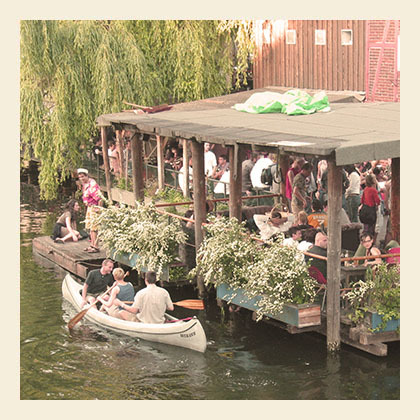 From friday to sunday-where you should party during your stay in Berlin!!! IF YOU ARE LOOKING FOR AN ORGANIC VEGAN RASTAURANT have a look HERE!! Superman was the work of Jewish cartoonists—as were Batman, Spiderman, and other superheroes of the era. Ever since the comic strip was invented in the immigrant neighborhoods of New York, Jewish artists have played a key role in developing the medium. The exhibition draws on the work of over forty artists to trace the history of Jewish illustrators, scriptwriters and publishers of comics throughout the twentieth century. It presents heroes and anti-heroes, hard-hitting opponents of Hitler, and neurotic petty bourgeois. With over 400 objects on display, it spans an arc from the first superhero comics of the 1930s and 1940s, through the underground scene of the 1960s, to the more challenging literary format of our time, the graphic novel. Veterans of the medium such as Rube Goldberg, Will Eisner and Harvey Kurtzman are represented along with contemporary artists such as Art Spiegelman, Rutu Modan, Joann Sfar and Ben Katchor by numerous original drawings, sketches, and comic books. When: 30 April—8 August 2010. Opening: 29 April 2010 at 7 p.m.
cycle a route which takes you by buildings with ecological installation, sustainable clothing stores, an intercultural market, alternative housing communities, organic restaurants and shops, an urban farm, a do-it-yourself workshop. Issues like transport and urban activism will also be talked about! The Berlin Biennale is the forum for contemporary art in one of the most attractive cities for art. Taking place every other year at changing locations throughout Berlin it is shaped by the different concepts of well-known curators appointed to enter into a dialogue with the city, its general public, the people interested in art as well as the artists of this world. one of my all time favs – they know how to move the crowd.enjoi big time! IF YOU ARE LOOKING FOR AN ORGANIC VEGAN RESTAURANT have a look HERE! !